WASHINGTON — President Donald Trump was not the first leader to use tweets, the Rt. Rev. W. Darin Moore told a crowd Monday from the steps of the United Methodist Building, across the street from the U.S. Capitol. 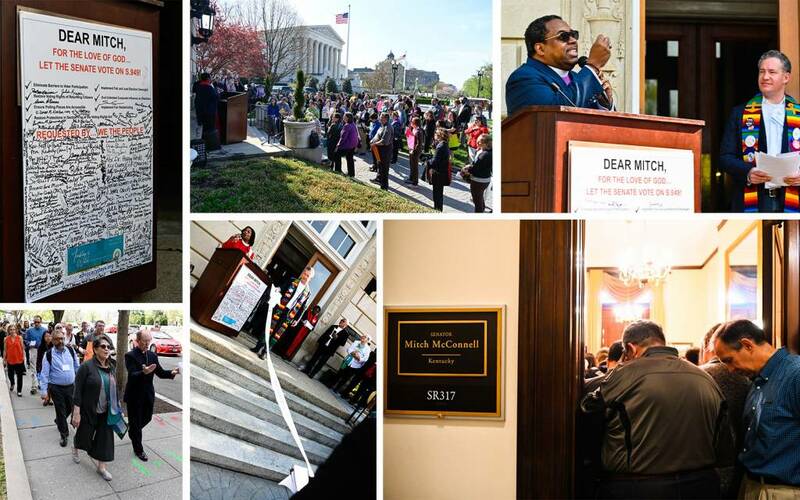 (Top row, L to R) A sign on the front of the lectern on the United Methodist Building steps spells out the Ecumenical Advocacy Days petition to U.S. Senate Majority Leader Mitch McConnell; The Lobby Day rally took place on the steps of the United Methodist building, next door to the United States Supreme Court; The Rt. Rev. W. Darin Moore speaks as the Rev. Michael Neuroth looks on at the Lobby Day rally. 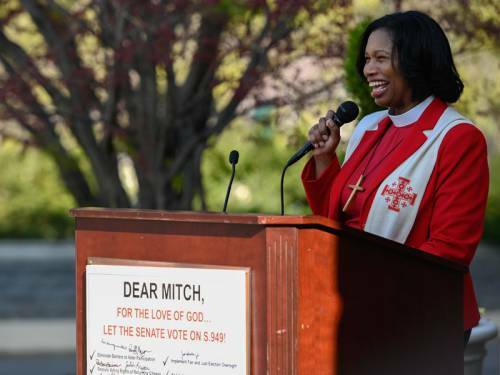 (Bottom row, L to R) Participants in the Lobby Day rally march down Constitution Avenue in Washington to U.S. Sen. Mitch McConnell’s office; A petition with signatures for U.S. Sen. Mitch McConnell was unrolled at the Lobby Day rally; Participants bow their heads and pray at the end of the public witness at U.S. Sen. Mitch McConnell’s office.